This book is a record of the contents of the papers accepted for publication as the Proceedings of the 7th International Conference on Algebraic Hyperstructures and Applications, held in Taormina (Italy) on June 13-19, 1999. 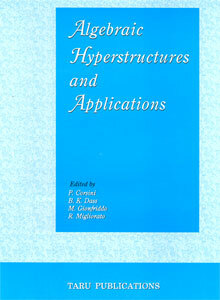 The papers in this volume display a wide panorama of myriad and diverse range of topics in Algebraic Hyperstructures in theory as well as applications. It presents a general view of the state of the current research accomplishment, significance of the results and future perspectives. R. Ameri (Iran), A. H. Babareza (Iran), A. Rahnamai Barghi (Iran), Rita Procesi Ciampi (Italy), Piergiulio Corsini (Italy), Giuseppe Gentile (Italy), Daniel Hort (Czech Republic), A. Iranmanesh (Iran), James Jantosciak (U.S.A.), Violeta Leoreanu (Romania), A. Madanshekaf (Iran), Christos G. Massouros (Greece), Gerasimos G. Massouros (Greece), Renato Migliorato (Italy), Rosaria Rota (Italy), Thomas Vougiouklis (Greece). Orders may be placed with remittance by cheque/draft favouring TARU - Books & Journals. Prompt supply by AIRMAIL at our cost. No other charges. Proforma invoice can also be sent to facilitate payment at your end. Taru Publications is one of the leading exporters of indian books, suppliers of indian books, distributors of indian books, wholesalers of indian books.